Single-use instant heat pack offers a convenient and cost-effective method of delivering localized heat therapy for muscle aches and strains. Controlled temperature therapy. 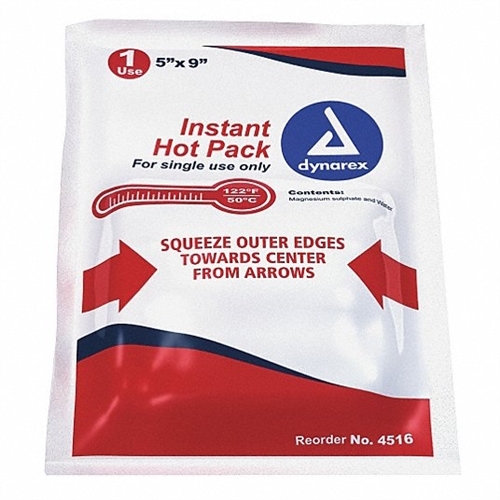 Ready when you need it, the heat pack requires no special preparation. Store at room temperature and activate in an instant with a firm squeeze and a gentle shake. For moist heat therapy, wrap in a moist towel and apply to affected area. Approximate peak temperature and therapeutic time duration:110Â°F/ 43Â°C, 30 minutes. Features: Instant Heat Single Use, Store at Room Temperature Activate with a Firm Squeeze and a Gentle Shake Wrap in Moist Towel for Moist Heat Therapy Lasts 30 Minutes. Pro Advantage Guaze Sponges Non-Sterile 12-Ply 4" x 4" Pro Advantage Woven Bandage 4"x 4.5 yards Pro Advantage Guaze Sponges Sterile 2s 12-Ply 3" x 3" Pro Advantage Nail Nippers & Splitters 5"